概要： This podcast is special as it is more of an homage than a conversation like the ones orchestrated for Archipelago. It is an excerpt of a recording — I apologize for the bad quality of the sound — I made in October 2011 with poet-artist-philosopher-architect Madeline Gins. She died on January 8, 2014 and it is not without emotion that I listened to this recording again. 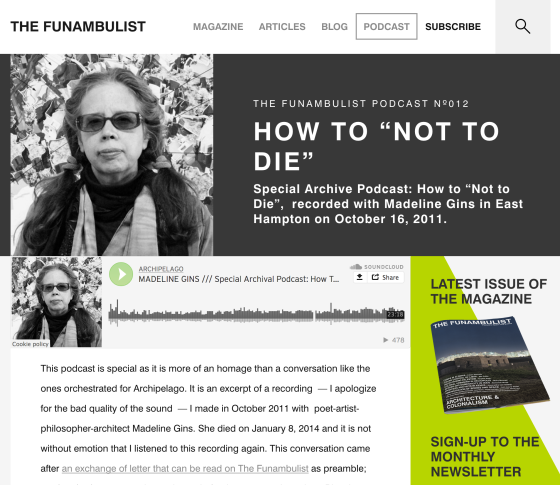 This conversation came after an exchange of letter that can be read on The Funambulist as preamble; we then had a conversation at the end of a day spent at the unique Bioscleave House designed by Gins and her late husband Shusaku Arakawa, to incarnate an architecture for bodies “not to die.” The photographs below will certainly provide a useful complement to the recording for the listeners who are not familiar with the work of Gins and Arakawa .